That’s right, it’s that time of the year again. Our biggest and best sale hands down. Christmas Complete getting a whole new meaning. We’re open from 6am-8pm, all SHOP completes from 6-7am are $60, from 7-8am are $70, and from 8am -8pm are $80. Our shop competes come with a Seasons Deck, Thunder Trucks, Spitfire cheap shots, Jessup Grip, and Seasons Wheels. Everything in the shop will be 25%-70% off (EXCEPT HARD GOODS) we’ll have a sale on all that stuff too. 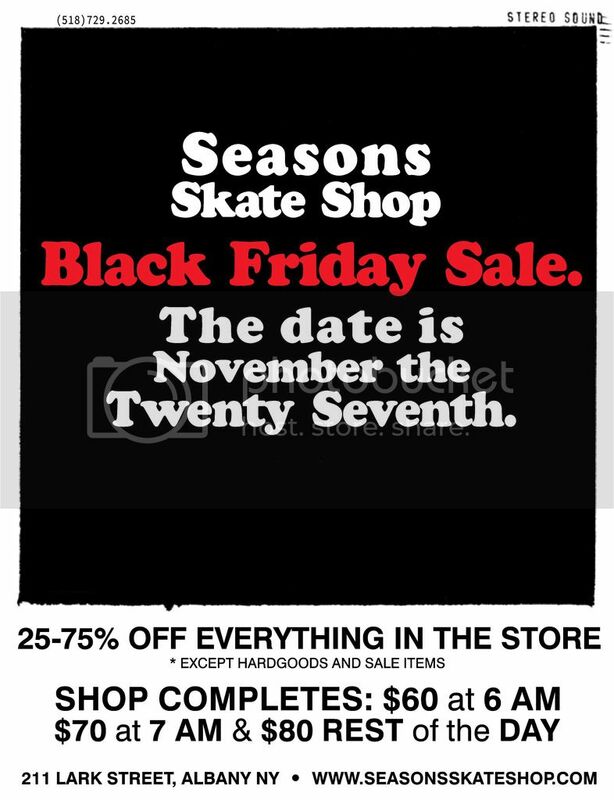 This entry was posted in Featured, News and tagged Albany, Black Friday Sale, Completes for Cheap, Sale Shoes, Save money, Seasons, Seasons Skate Shop. Bookmark the permalink.